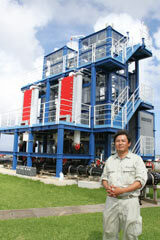 Shin Okamura, Xenesys Inc. section chief responsible for managing the Ocean Thermal Energy Conversion. May 30 on Kume-jima. Thermal Energy Conversion because of the temperature of its waters. This power generation makes use of the energy that converts the temperature difference between the ocean’s warm surface and cold deep water into electric power. This can only happen if there is a temperature difference between the surface and deep water. Possible sites that have more than 20 degrees difference are Kume-jima, Ishigaki and Miyako. According to the Ministry of Economy, Trade and Industry, Japan’s energy self-sufficiency rate, including natural energy and fossil fuels, was about 4 percent in fiscal 2010. “Fossil fuels will run out soon, so from now we should try to increase the figure of 4 percent,” said Shin Okamura, a section chief at Xenesys Inc., which is responsible for managing the OTEC. Producing high-quality energy by attracting Japanese technology will help to create new jobs and industries. “Ocean Thermal Energy Conversion can generate more stable electricity than wind or solar sources due to its constant temperature. The power generation plant on Kume-jima will become our showroom to the world,” said Yasuyuki Ikegami, a researcher at Saga University, who has studied the ocean for more 30 years. The plant is now successfully generating 10 of its maximum output of 50 kilowatts. It will connect its transmission lines with those of the Okinawa Electric Power Company from June and will be able to use private power generation in the facility. On June 16, the Okinawa Prefectural Government will hold a power distribution ceremony for the demonstration plant.